I bought my first ever camera in 2001, aged 31. Novice and self-taught, I did some tries with negative films and followed the photographer ‘learning process’ with slides, which are more rewarding formats to expose my preferred subjects: nature and environment. I do my utmost to restitute as accurately as possible the wonders of mother nature that are just next to me, by essential capturing around Picardie, where I’m living in the countryside, and on the banks of ponds, in the undergrowth and sometimes in the Somme Bay. Every time I try hard to take picture that would be as aesthetic as educational. 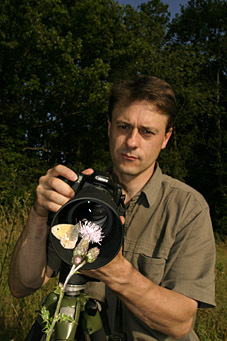 In 2002, at the Nature and Birds Festival in the Somme Bay, I met some incredible nature photographer who did an amazing work. With their well-informed eye, they favorably judged the few pictures I showed them and encouraged me to go further and hold on. That’s why I decided in 2003 to display some of my pictures to the Bios Agency in Paris, who agreed to publish some and offered me a publishing contract. That was an amazing and exciting surprise for a laborer like me, who didn’t even have a degree and would be able to become a professional photographer. But, the hard work at the factory was still a necessity for me, as buying photograph and informatics devices was very expensive. This enhancing employment took me way to much time and energy to the cost of y favorite activity: nature photography. But it didn’t degrade my determination to be the witness of a wonderful wild nature continuously threatened. My dedication and motivation remained intact as I still observed the devastating effects inflicted on our natural environment by our corrupted societies, which inexorably persist in an exponential and regrettable increase of economical and industrial activities.